From backyard and rooftop gardens to community plots in parks and vacant lots, urban agriculture has become a nationwide movement, and more homeowners have taken an interest in producing their own food. For many urban homesteaders, it stems from a desire to know where their food comes from and live more sustainably. Are you interested in participating? These three small-scale projects are great places to start. Chickens provide a relatively inexpensive, low-maintenance way to feed your family, plus they act as complimentary fertilizer and chemical-free pest control. Before you buy baby chicks, make sure you research and follow local laws, city ordinances and homeowner association rules. 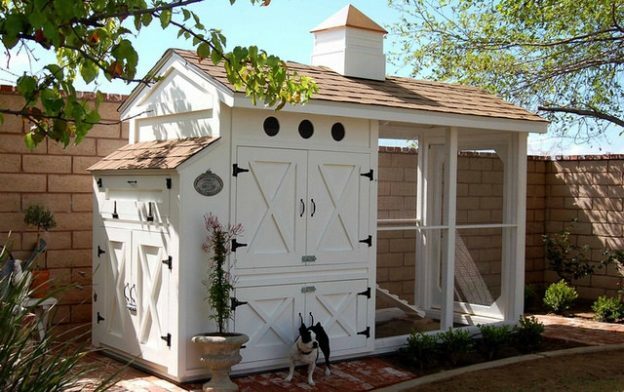 Get inspired by the luxe chicken coop design above and then check out these DIY tips to build the perfect home for your feathered friends. In the 1940s, America had five million beehives, and today, roughly half of those remain. A growing awareness of this drastic decline has led to an increase in urban beekeeping, to the tune of approximately 120,000 backyard beekeepers. Becoming a beekeeper starts with a lot of research, followed by choosing the right equipment and bees. Don’t want to care for an entire colony? Plant native flower and weed varieties that help encourage bee pollination and reproduction. Whether it’s a large plot or a small section, a personal garden gives you control. Plus, you can preserve fresh fruits and vegetables via the canning process. While many homesteaders use yields from their garden, others buy extra produce in its peak season. Canning veggies and fruits is a family-friendly activity that lets you enjoy seasonal produce all year long. Though urban homesteading may seem intimidating at first, it’s easier to start small. The projects above can help minimize your impact on the environment and allow you to take part in your own food production. This entry was posted in DIY, Tips and Advice and tagged backyard, beekeeping, chicken coop, DIY, garden, homestead, urban on March 16, 2017 by admin.